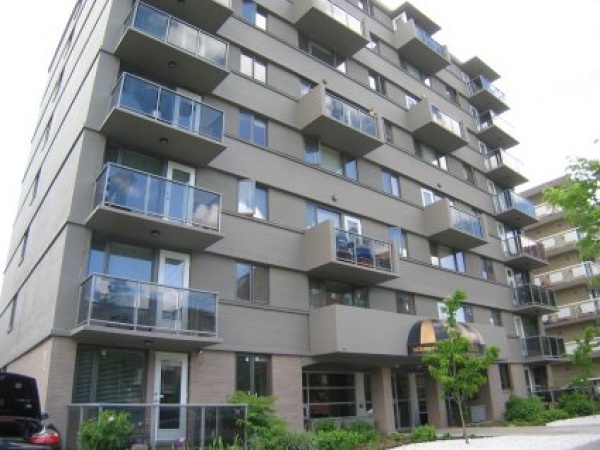 Built in 1969 as the Quail Pointe rental tower, this eight-storey concrete building became condo homes in 2005 when attractive renovations were done to the exterior, all common areas and every suite. The glass-panel railings are a sophisticated touch for the 37 suites, which feature darker paints palettes, maple cabinetry, stainless-steel appliances, granite counters, and all-in-one washer/dryers. In-suite electricity use is included in condo fees at the Biltmore, as is saving towards eventual replacement of exterior windows and doors, as those are common property. Those were all replaced in '05 with the conversion, so it will be a long time before that reserve-fund cash is needed. Parking is all outdoors, assigned common property, with some stalls tucked under the back of the building.The one-bedroom suites here start at 636 square feet, while two-bedroom suites range from 838 to 893 square feet. Above the ground floor, which has two suites at the building's front, there are only five suites per floor, so four out of five have corner windows. Balconies are all independent and as far apart as possible, so nobody is sitting nearby on the other side of a balcony partition.As mentioned, exterior windows and doors are common property. I keep the Biltmore's Condo Plan on file.